Celebrating a successful Miami Yacht Show : Atlantic Yacht & Ship, Inc. Formerly known as the Miami Yacht & Brokerage Show, Yachts Miami Beach started today with hundreds of yachts for sale on Miami Beach. Yachts Miami Beach will transform Collins Avenue into a multi-million dollar presentation of yachts including the world’s most extraordinary and uniquely designed yachts and superyachts from the world’s foremost custom boat builders. 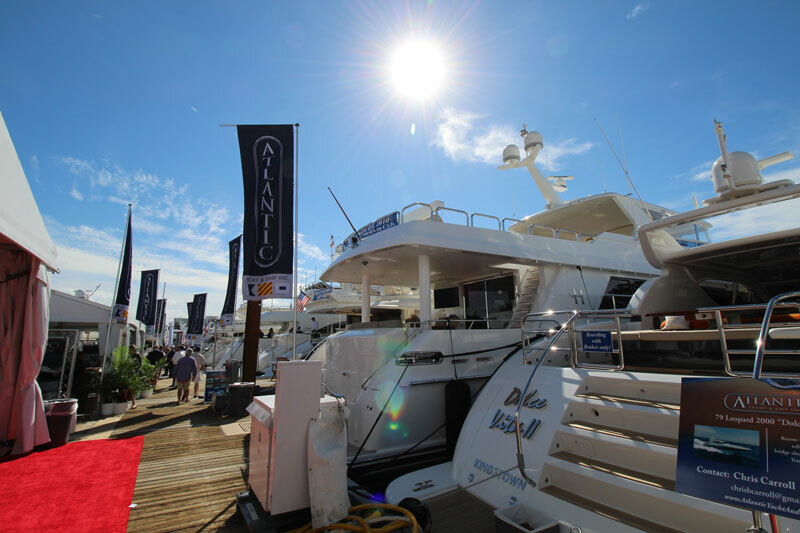 The 28th Annual in-water-only display presentation covers more than 1.2 million square feet of space over a mile-long strip of Indian Creek Waterway, featuring hundreds of new and pre-owned vessels valued at more than a billion dollars. Be sure to stop by the Atlantic Yacht & Ship display located on the West (face dock) side of Ramp 16. We have a variety of yachts for sale on display including used Azimut yachts, used Sunseeker yachts, used Benetti yachts, used Hargrave yachts, used Leopard yachts, used Ferretti yachts, used Grand Harbour yachts, and the New Zeelander yacht display. Today is the last day to come by and say hi before the Palm Beach Boat Show. Come see us at the Miami Yacht Show!